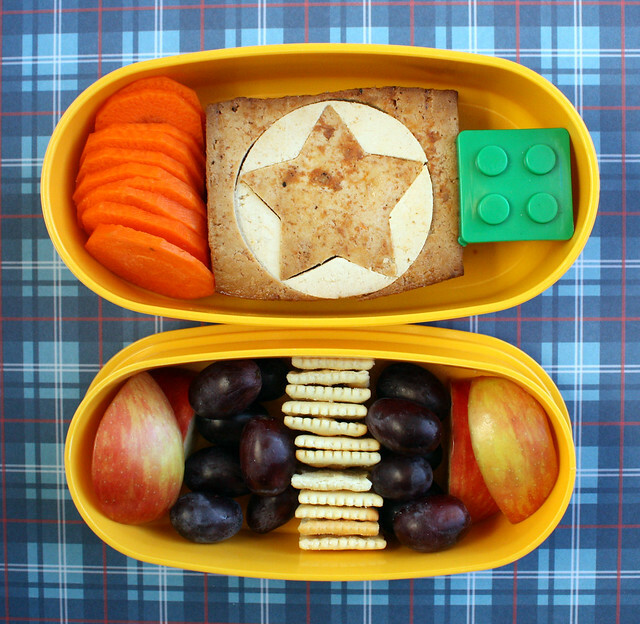 We were running super late on Monday so Wyatt had school lunch (despite the fact that I packed half his lunch the night before!). We had a little bit of a squirrel thing going on with Augie’s lunch on Tuesday. 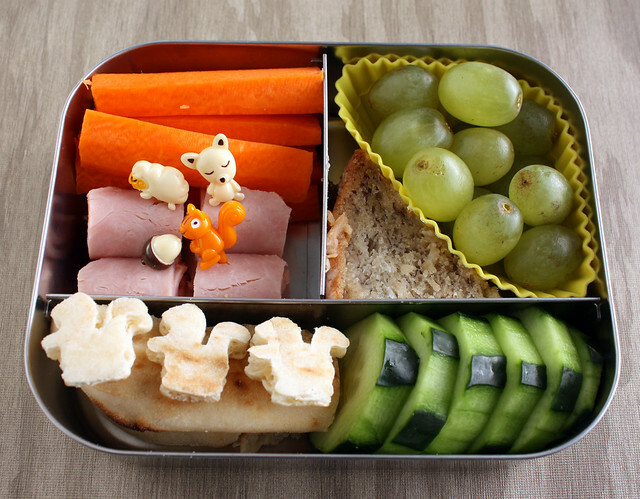 He had carrot sticks, ham roll-ups on super cute animal picks (including a squirrel and acorn), grapes, a little bit of coconut lime banana bread, cucumber slices and some garlic naan with squirrel cut-outs on top. This was packed in our Lunchbots Trio. 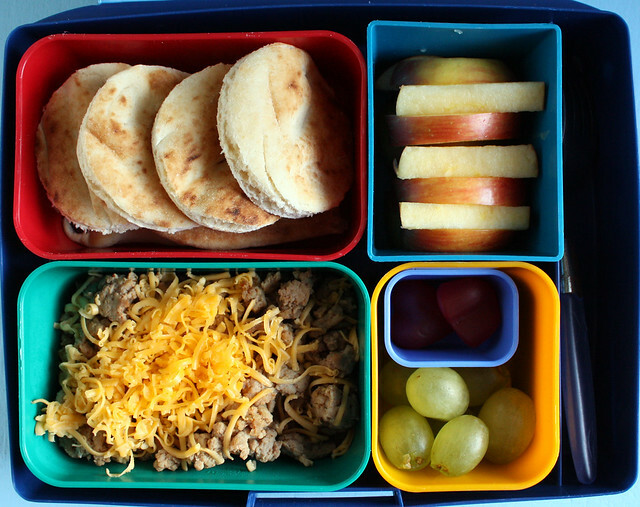 Wyatt got the lunch I started packing for him Sunday night: garlic naan cut into circles (the scraps are underneath), sliced apples, a couple jube jelly hearts, green grapes and leftover taco meat with cheese. Normally I give him chips when I send taco leftovers so he can just scoop it up, but I forgot to buy chips when I went to the store. Poor Wyatt. This was packed in our Laptop Lunches box. And this is what came home! Almost everything. From comparing the photos, I think he had one piece of bread and a little bit of the turkey. No fruit. He also ate the candy, of course. 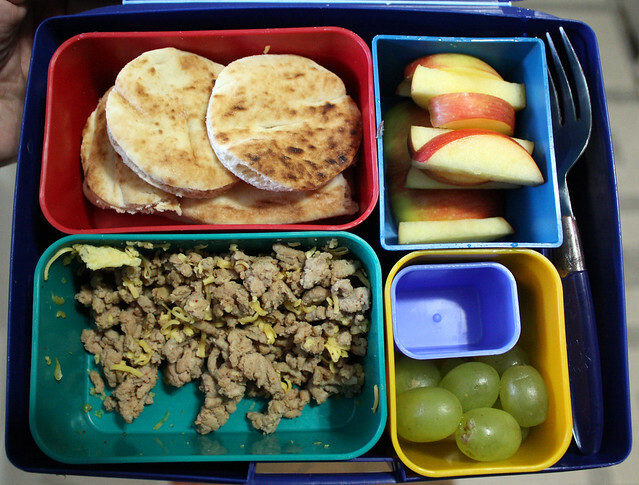 I wish I’d taken an after shot of all of his lunches this week so I could show you how he barely ate anything. Sometimes I think that kid survives on air! 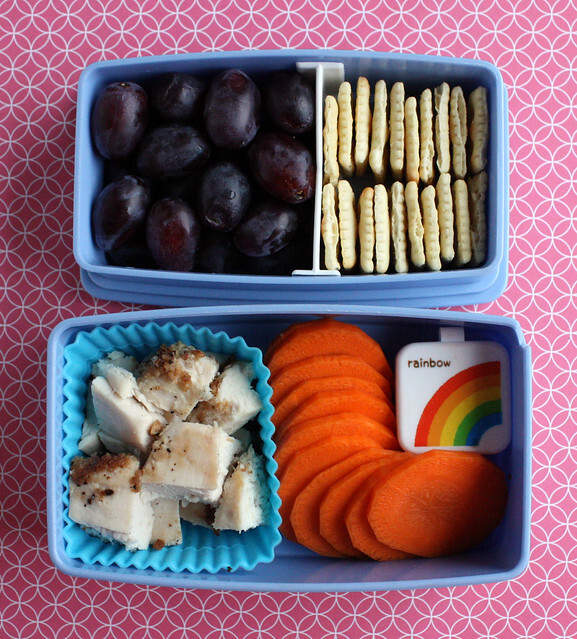 Wednesday, Augie had grapes, mini saltines, carrot coins, hummus (in the rainbow box) and leftover chicken cutlets with all the breading picked off. The breading was not a hit with the kids. 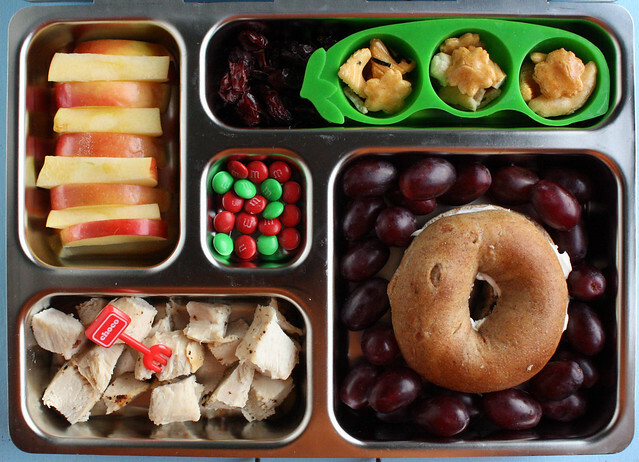 Wyatt’s lunch was packed in the PlanetBox : apple slices, dried cranberries, rice crackers in a peapod cup, grapes, a cinnamon bagel with cream cheese and leftover chicken and a few mini M&M’s leftover from Christmas. I also included a mini-fork for him to eat the chicken with, but the M&M’s slid down into the chicken compartment in transit and got chocolate all over the meat so he didn’t eat any of it. 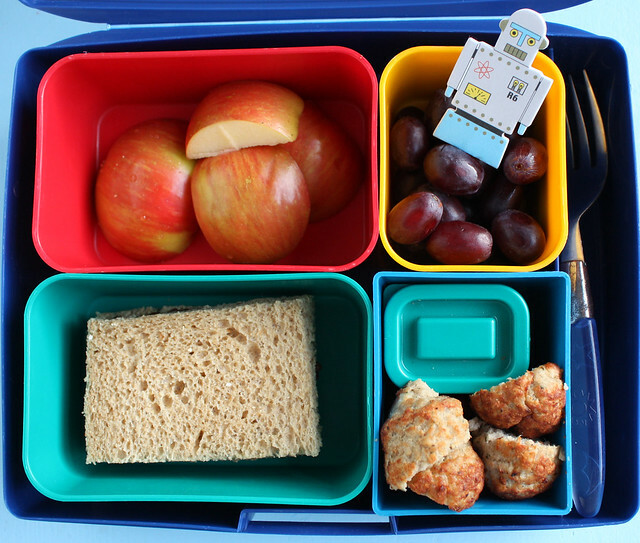 Thursday, the boys had nearly identical lunches food-wise: carrot coins, baked teriyaki tofu, hummus (in a Lego cup), apples, grapes and mini saltines. 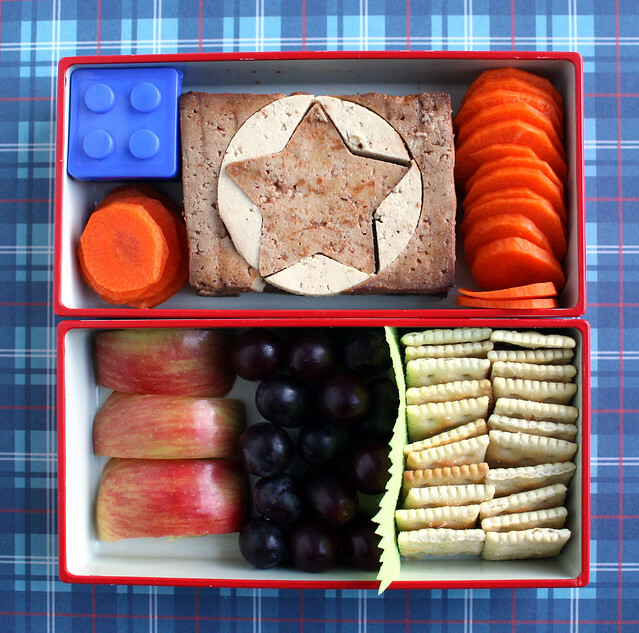 The only changes I made for Wyatt’s lunch were the box I packed it in (he had a cool Lego-shaped bento), the way I arranged the food and I swapped out the hummus for ranch dressing. 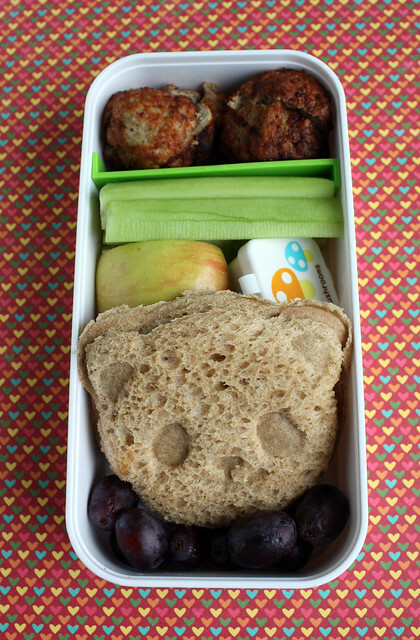 Today, Augie had turkey meatballs, cucumber spears, hummus, a couple apple chunks, a sealed PB&J made with our panda sandwich cutter/stamper, and a few grapes. Wyatt had apples, grapes, meatballs with ketchup for dipping and a boring rectangular jam sandwich.